• Compact and portable power planer/thicknesser with heavy-duty cast base for accurate and smooth operation. • Accurate fence tilts between 45° and 90°. • 2 Blades capable of handling timber up to 200mm wide. • Maximum Cutting Width x Depth: 200 x 2mm. • Easy conversion from planer to thicknesser. • Safety power micro switch ensures dust safety guard is fitted correctly preventing incorrect setup. • Thicknesser fitted with feed rollers. • NVR Switch prevents uncontrolled re-start after power interruption. • Includes dust extraction port. • Suitable for woodworking and workshop applications. • Model No. SM1311 • List Price £ Compact and portable power planer/thicknesser with heavy-duty cast base for accurate and smooth operation. Accurate fence tilts between 45° and 90°. 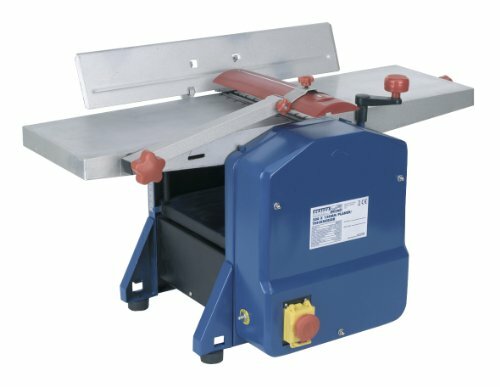 Fitted with two blades capable of handling timber up to 200mm wide. Easy conversion from planer to thicknesser. Safety power micro switch ensures dust safety guard is fitted correctly preventing incorrect setup. Thicknesser fitted with feed rollers. No-volt release switch prevents uncontrolled re-start after power interruption. Includes dust extraction port.